On Sept. 9, three months after his death, the Television Academy honored Anthony Bourdain with multiple wins at the 2018 Creative Arts Emmy Awards. The late chef and his CNN show, Anthony Bourdain: Parts Unknown, were nominated in six categories and won in five. The series picked up three trophies for picture editing, sound editing, and sound mixing. Bourdain himself won two individual awards, one for best informational series and the other for writing for a nonfiction program. In addition to those wins, Bourdain also received an Emmy for best nonfiction short or reality for Parts Unknown's digital webseries spinoff, Anthony Bourdain: Explore Parts Unknown. The late TV host had previously won four Emmys, the most recent of which was for the best informational series or special in 2016. 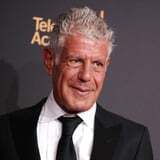 According to HuffPost, Lydia Tenaglia - Bourdain's longtime collaborator and an executive producer of Parts Unknown - accepted the nonfiction writing Emmy on his behalf and referenced the eight previous nominations Bourdain received for writing. "Tony was nominated for this Emmy many times. It was the one award he secretly coveted but it had always eluded him," she noted. "So it's with a sense of bittersweetness that I accept it tonight on his behalf." "Tony is truly off on a trip to parts unknown now. I wish we could be there to shoot it," she added. "I'm sure he would have written the hell out of that episode." The 12th and final season of Parts Unknown will air in seven episodes this Fall on CNN. Though initially scheduled to be removed from Netflix on June 16, all eight of its previous seasons are still available to watch "for months to come."